Main Components to a G.C. Our G.C. is going to take a small sample of the process and separate out the components which make up the process, measure them, and tell us the results. Then it's going to do it all over again. After completeing this section I will expect you to remember the main carrier gases used. The main detectors I believe you will see. What is the most critical part of a regulator. Name some different types of columns. The three main carrier gases you will see are He, H2, and N2. You will only use N2 as a carrier when looking for a H2 peak. Now read that line over and over about fifty times. Helium is a noble / inert gas which means that it doesnt bond or react with other molecules. With todays G.C. I have seen applications where they use helium as a carrier and seperate out hydrogen and measure it. This is not a common thing due to how close their thermal properties are. Hydrogen is probably the most commonly used carrier gas. Why? It has the highest thermal conductivity of everything. It is plentiful, unlike helium which will run out one day. The main reason I say it is though is because we use for an FID and FPD. These two detectors utilize a hydrogen rich flame to measure the components. What does the carrier gas do? Carrier gas pushes our sample through our valves and into a column or columns which seperate the components and then carries them to the detector. Carry is to nice, it forces them. All of this happens in the oven of our analyzer. A TCD uses the difference in temperature when a compound passes across a thermistor bead versus just carrier gas going across the reference bead. 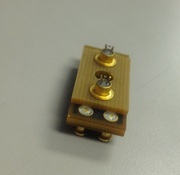 The bead will change it's ohm value as the components cross it. Also note, the bead will heat up as components cross it. The reference bead only sees carrier gas, ever....... 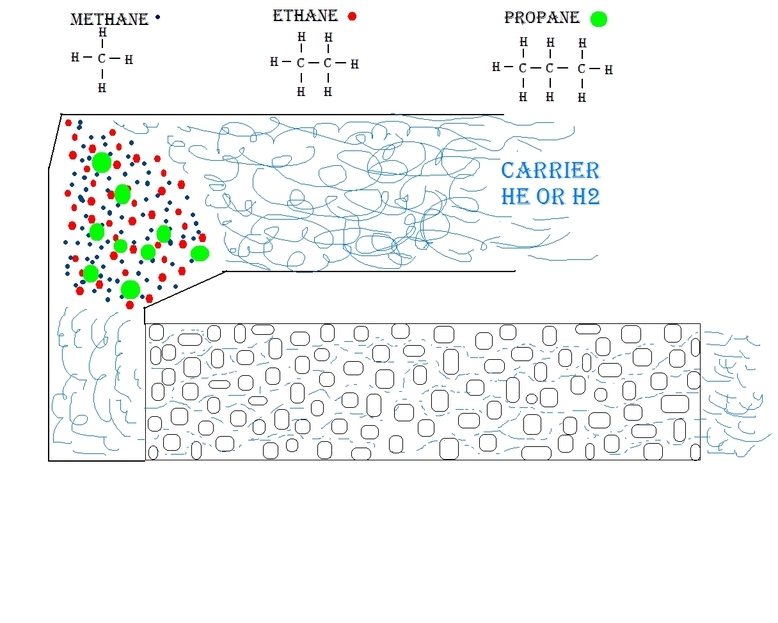 Lets say we have methane and ethane in our sample and we are using H2 as a carrier gas. H2 will be flowing across the reference bead and out to vent at a constant 40 cm 3/m flow. Carrier gas is flowing across our measure bead at 40 cm 3/m. Carrier gas will push our components through a column and seperate them. As they leave the column and cross the bead, it will rise in temperature. This rise in temperature will make our ohm value change and we will measure this response on our chromatagram. Without getting too technical because I barely understand this. We will have a hydrogen rich flame burning. So right off the bat we need air and hydrogen to make a fire. I have seen companies use helium as a carrier gas in one of these but why not use hydrogen as the carrier since you have to have it anyway. Most set ups just use hydrogen as the fuel source and as the carrier. Our column will be connected to the tubing feeding the flame. As the components come out of tyhe column and get incinerated by the flame they become ionized and accept a bias voltage and give it to a collector plate situated right above the fire. This current flow is then magnified to a detectable signal. These detectors are awesome for detecting ppm level hydrocarbons. They have been used in the ppb level. If you are trying to see large amounts of something ------ not a good idea. You will saturate the detector and it will be burning for days. If you are wanting to see how much N2 is in a sample, IT CANT.... We will discuss hydrocarbons later on. Everyone repeat after me. FPD's are used to see sulfur compounds. Say it again. We often see these being used as a CEMS looking for H2S. And these analyzers are not linear so we use two calibration bottles. Low bottle around 30 ppm and a high around 240 ppm with the range at 300. An FPD like an FID has a H2 rich flame and as the components come out of the column and are introduced to the flame, the sulfur will burn and produce a blue light. Placed right there watching the flame is a PMT ( photo multiplier tube ) and as it sees the light it produces a signal. The more light it sees, the higher a signal it produces. Through a filter, the only light that the PMT will see is the sulfur. The PMT does exactly what it says, it amplifies the signal. Also note ---- I have seen these analyzers with a sample splitter before it makes it to the detector. 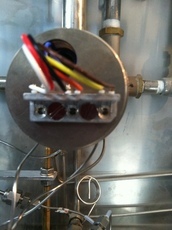 Our regulator is critical to our analyzer. The pressure must remain completely stable in order for our flow through the analyzer to be stable. A stable flow through the analyzer will repeat where the components come out each run. The oven temperature along with our flow and sample size and pretty much everything is a constant or we will not work right. CONSTANT. When everything is a constant then our peaks will produce the same result over and over. Peaks will come out at the same time every time. If I were going to explain columns to you in the scientific way I would use words like Adsorption versus Absorption and Diatomaceous earth. I almost choked on that word. Instead I want you to say we have a packed column or a capillary. Packed Column -- The smaller molecules will move through this column faster. Everyone will come out in the order of their size. Remember that we have carrier gas pushing our sample through our column and they will come out eventually but the small ones fly through fast. Lets say we are at an obstacle course and we have tunnels to go through and tight spaces to weave around and through and we race three guys. One is 165 lbs. The next is 245 lbs and the last is 320 lbs and they are all three 5'10"
1,2,3 GO..... The small guy will weave his way through the course with little effort. Our medium guy bounce off things and push his way through the course but not as fast as our small guy and then last is our big guy. He will struggle and fight to make it to the finish line and will be a long time after our small guy went through. Capillary Column -- Not just a capillary column uses this principal but lets go with it. If you have two components that have almost the same boiling point and very similar how do we seperate them? For instance Propane and Propylene. 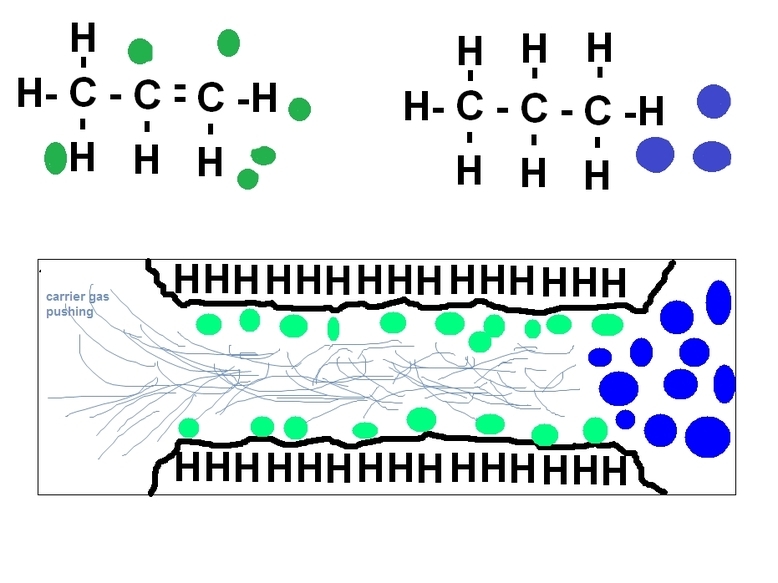 C3H8 versus C3H6 They bath have three carbons but one has a double bond. C3H6 is looking to bond. C3H8 is happy and in a great relationship but C3H6 is on the hunt. We will take advantage of the this and line the walls of our column with something that it will try to pull off the wall and bond to but it can't. C3H8 comes into the column and barely slows down. C3H6 is trying to pick up everything in the column. Unfortunately for him the carrier gas is pushing and pushing and finally pushes him right out the back door. As far as columns go and knowing things about them. This is what you ( students )need to know. Read your flow sheet and it will tell you what it's job is. If you need a little more seperation, add some more of the same column. Know that a Mole Sieve column seperates O2 and N2...... You will see these your entire career. You should always bake in the columns overnight. When a column is baking in and the detector is going nuts, this is due to the column bleeding off. Give it time. Kick up the temp and the flow and walk away. If you are cleaning out lines and get a slug of acetone in your column by accident, yeah its done. You killed it. Get a new one and don't do that again.